A gorgeous original timber millers cottage, built around the turn of the last century to house their families. 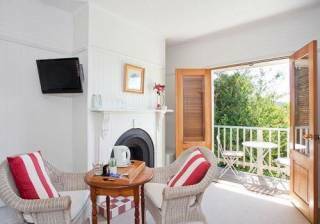 Lovingly restored as holiday accommodation retaining all its character and charm. Rough sawn timber lined walls, painted floorboards with an eclectic mix of country furnishings. Each cottage is unique and individual. Country style eat-in kitchen with everything you need to self cater. Oven and cooktop, microwave, fridge and crockery and cutlery. The bathroom has a small hip bath with overhead shower, vanity and separate toilet. And laundry facilities. Extra $25 per night, per child. There is a min. two night stay in all our cottages. Set high on the banks of the Henderson creek, Riverbank is perfect for your large family, couples, or friends getaway. Enter off the rear balcony into the ground floor open plan living area. There is flat screen TV, DVD player, ipod dock for your entertainment. A slow combustion wood fire and additional gas heating provide ample warmth for a cosy retreat. Upstairs on 2nd level 1st bedroom has 2 x singles, 2nd room with King and 3rd bedroom with Queen bed.Spend some time on the petite front deck in an Adirondack chair, soaking up the serenity of valley surrounds. Babbling creek, birds, and the sound of nothing! Extra $25 per night, per child. There is a two night min. stay at all of our cottages. Originally built by sawmillers around the turn of the last century to house their families. Deceptively spacious, Rose cottage has large open plan kitchen,dining and carpeted living areas. Sun streams in windows on every wall and skylight. Each window has a different vista over the creek, river and rambling gardens. Main bedroom has queen size bed, second bedroom has twin singles and antique swedish day bed suitable for a child in sunroom area, each with electric blanket, fresh white linen and feather doonas. Extra $25 per night, per child. There is a min. two night stay in all our cottages. As the name suggests, a traditionally built house with twin gabled roof, 'Gables' is a popular choice for two couples. Under one gable is bedroom with queen bed, bathroom with full size bath and vanity, separate toilet and laundry facilities. Under the other gable is a second bedroom with twin singles, and kitchen at the rear. 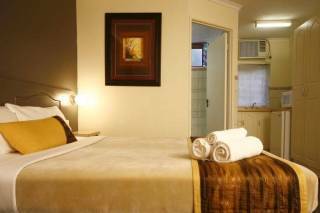 Beds all have electric blankets, feather doonas and fresh white linen and towels. Extra $25 per night, per child. There is a 2 night min. stay at all our cottages. 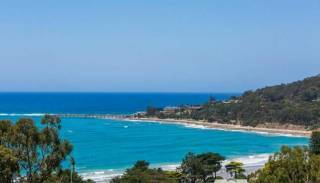 An easy two hour drive from Melbourne, mid way along the Great Ocean Road . 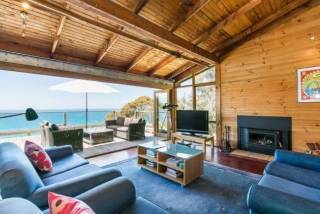 Enjoy all that the surf coast has to offer without the noise, traffic, hustle and bustle! We offer you a choice of self contained, private and individual accommodation for couples, groups and families. Ideal venue for your special event, intimate wedding party and more. Each cottage boasts gorgeous views of our stunning river and valley setting. Choose from 5 unique private and individual cottages, each with well equipped kitchen, bathroom, spacious living with wood fires, seperate bedrooms with queen, king and single beds all linen and towels are provided. Front and rear balconies overlooking the river and creek each with BBQ. 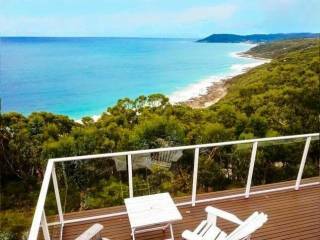 Just 2 km from the town centre of Lorne, in a world of our own. ‘Allenvale’ is simply stunning. Kilometres of beautiful walking trails through rainforest to waterfalls, pick an apple from our century old organic apple orchard. Follow the St George river trail (Mountain to Surf Run), over river crossings to where the river mouth meets the beach and opens out to the sea. Stroll up the Allenvale Road to Lorne's premier Art Gallery 'QDOS', and enjoy fine food, wine, sculpture and constantly changing art. 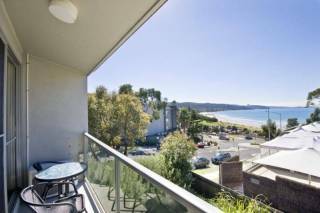 The perfect base for all your Great Ocean Road and Otway Hinterland explorations. Pack a picnic and take the day to wind your way through Apollo Bay, to the Twelve Apostles, Otway Fly Treetop Walk, olives groves and wineries. Exceptional convenience, comfortable eclectic mix of country furnishings, rustic charm and stunning beauty. We share the natural wonders of the area with a vast array of native fauna and birdlife. Kangaroos, Koalas, Possums, Kookaburras, Blue Wrens and Bower Birds to name just a few. "Part of the enchantment of Allenvale is driving down the gravel road and over the bridge to discover this gem of a place. Our daughter felt as though she had found the children's house in the Enchanted Wood, complete with ducks, river and forest. Kero is everything we wished for, cosy, tasteful, rustic with a touch of luxury - love the big soft cushions! This is the perfect getaway surrounded by the best of nature. Thank you for sharing Kero with us, we will certainly return. Our daughter wants to move here!......... Heaven" - Janine, Lola and Chris. Terms & Conditions Credit card details required to confirm all reservations. Payment is due in full upon arrival. Payment can be made via EFTPOS, cash, mastercard or visa. Direct deposit also available prior to arrival upon request. Extra children $25 per night, per child. With more than 28 days notice no cancellation fee applies. With less than 28 days notice 50% of total accommodation tariff is payable. If period booked is relet in full, no cancellation fee is payable.